The New Year's Glasses DX are headgear in Splatoon 2. They are a 3-star item produced by SquidForce and come with the primary ability Special Charge Up. They can be obtained by visiting the FrostyFest news article on the Nintendo Switch News application. It can also be purchased from SplatNet Gear Shop for 13,653. 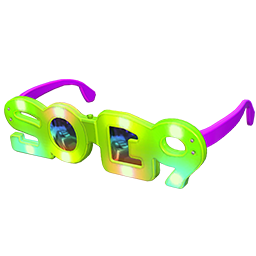 The New Year's Glasses DX are a large pair of glasses that are purple on the sides of the frames and bright green on the front. The green portion is in the shape of a four-digit Inkling number similar to "2019" and has flashing lights. The lenses, which are fully opaque and shiny, generally have a purple tint but can reflect a variety of colors. Open the Nintendo Switch News application and select the article about FrostyFest. The article is titled Free download! Celebrate FrostyFest with this wintry in-game gear. If the article is not visible, subscribe to Squid Research Lab Report (NA)[a] or Squid Research Lab Bulletin (EU)[b] and allow time for the news application to update with Splatoon-related news. Select the "Play Splatoon 2" button located at the bottom of the article to start Splatoon 2. Open the box that appears in the middle of Inkopolis Square. If this does not work, start over at step 1, or view the video demonstration below. The New Year's Glasses DX comes with Special Charge Up as a main ability. As a 3-star item, the New Year's Glasses DX has three additional slots for secondary abilities. Since it is made by the SquidForce brand, it has a higher chance of rolling Ink Resistance Up and a lower chance of rolling Ink Saver (Main) to fill its secondary ability slots. Despite being a limited item not available in Headspace, the New Year's Glasses DX can still be ordered from Murch. This functionality is shared with the other headgear from FrostyFest, the Eel-Cake Hat, Festive Party Cone, and Twisty Headband. An Inkling (far left) wearing the New Year's Glasses DX in a promo for FrostyFest gear. An Octoling wearing the New Year's Glasses DX in Inkopolis Square. Two male Inklings wearing New Year's Glasses DX in Inkopolis Square. A male Octoling wearing the New Year's Glasses DX. A battle at Blackbelly Skatepark, with an Octoling wearing the New Year's Glasses DX. This page was last edited on 7 February 2019, at 12:19.